Manager Mickey Callaway applauds his fast delivery to home plate. 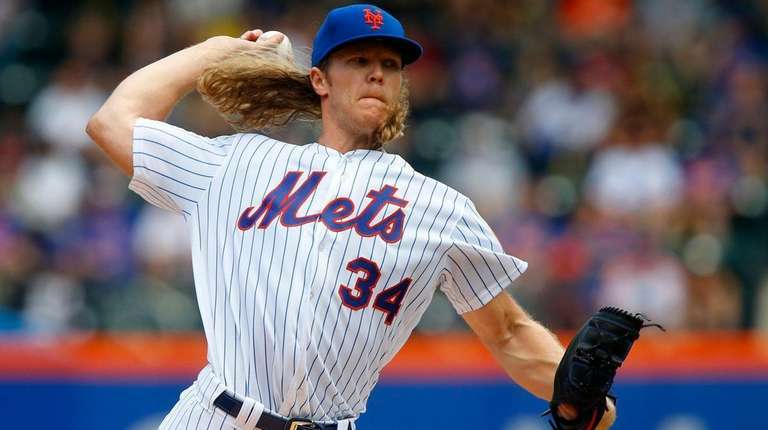 Noah Syndergaard has had his fair share of trouble slowing the running game, but he flashed some good signs in the Mets’ 4-1 win over the Diamondbacks Sunday at Citi Field. Arizona had just one steal, by Chris Owings, but catcher Tomas Nido said he bobbled the ball. Syndergaard also caught Paul Goldschmidt straying too far off first, and the Mets got him at second. “Even the one [Owings] stole on, he was 1.28 [seconds] to home, which is probably about the lowest time we’ve ever gotten on him,” manager Mickey Callaway said of Syndergaard. “He did a great job of holding. He got a pickoff, which was big. Syndergaard said he was “shocked” after seeing Jarrod Dyson not try to swipe second in one sequence. Lugo would be a prime option to replace a struggling or injured starter. Cabrera, Rosario power Mets to sweep over ArizonaThe Mets raced out of the gate, looking like the team to beat in the ... Lennon: This is the Amed Rosario Mets needThe young shortstop has had his moments here and there, but nothing to steal spotlight like he did against the Diamondbacks.